What kind of shoes are required for winter running, especially to avoid the slippery and frozen street pavement? 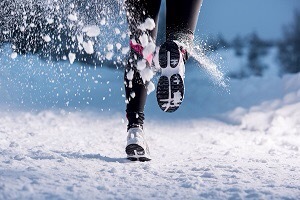 I know many runners who opt for trail running shoes in icy weather. I just run in my usual shoes and keep an eye on my footing. I use yak trax…they’ve been excellent all winter long!